Like us on Facebook and follow along on Twitter for updates as well as network with other QC folks. Even when it’s not a radio night, listen to share music in the QC plug.dj room, or cam up together on Zoom. Beyond Minecraft - Overwatch, LoL, SMITE, Fortnite, PUBG, and Cards Against Humanity each have dedicated Discord channels on QC. Join us each week for a different free game at 10:30 EST for Friday Night Game Night. 1st Friday: Drawful / 2nd Friday: Town of Salem 3rd Friday: Warlight / 4th Friday: Cards Against Humanity. Queercraft LIVE! On Saturday nights, convene for a LIVE radio show hosted by DJ Beaupedia. Request songs, hang out on webcam in our Zoom room and in-game on the Minecraft server. We have various special shows throughout the year where listeners play along in contests to win games. Listen to your favorite QC hits any time you like at www.queercraft.net/radio. Queercraft IRL? Queercraft IRL! With players all over the world, organized meetups mean a time to commune with other LGBTQ people and allies over shared interests. Connecting face to face affirms the important bonds created online and strengthens friendships for the long term. Our 2019 Meetup in New York City is this August 2nd & 3rd! Click here for more information. is a gaming community and online support network for LGBTQ youth and their allies. 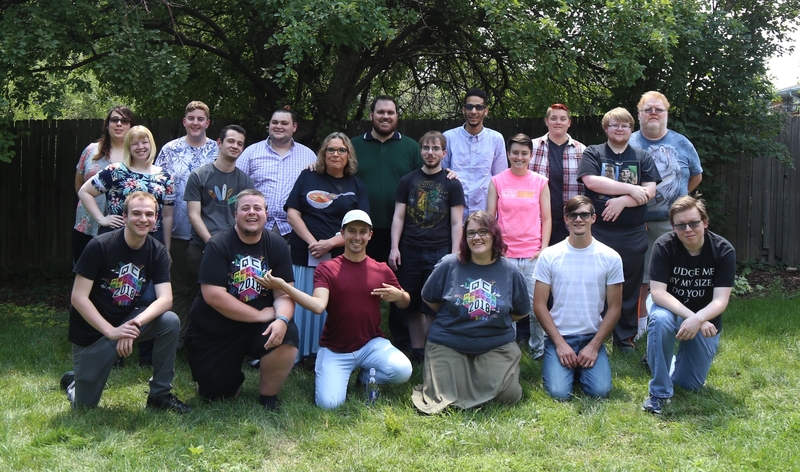 It's almost time for another Queercraft Meetup and we hope you will join us! Click the image below to be taken to our event site. Tickets are $100 (this includes access to the meetup events, meals, and prizes) and lodging is available. Reach out to Beaupedia or littlegreendanny in Discord, comment on the event page, or submit a contact form if you are interested in attending! As we prepare for our 2019 meetup we thought we'd share our photos and videos from our 2018 meetup held in Denver, Colorado in August. Click the photo below for the full album.